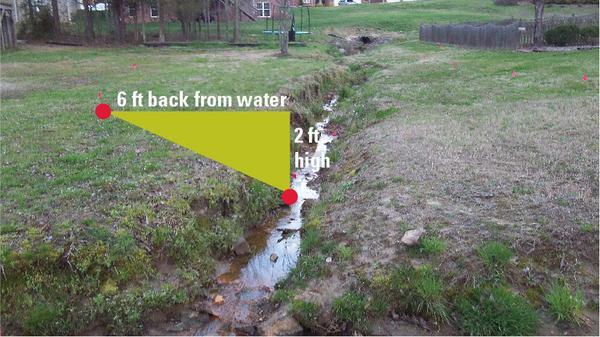 Are storms causing chunks of land to erode from a stream on your property? Maybe the stream has started cutting deeper into the channel, creating more of a gully. Perhaps the stream is widening, threatening your property, buildings, or a road. If you have also wondered why your stream bank seems to be changing rapidly, it is likely tied to the fact that North Carolina is urbanizing. We have more homes, commercial buildings, parking lots, and roads, but fewer natural landscapes to slow down rainwater runoff. In these areas, there is less water soaking into the ground and more stormwater flowing directly to our streams. In a 1-inch rainfall, a one-acre parking lot could produce as much as 27,000 gallons of runoff flowing to local streams. Annual rainfall in the piedmont of North Carolina is over 45 inches, with greater amounts in other areas of the state. All of this water adds up. Increased runoff causes the height of water in urban streams to often rise and fall more quickly during and after rainfalls. This fluctuation can saturate and loosen soil on the stream banks. Increased runoff volume also results in increased velocity within the stream, which increases the potential for erosion of the banks and deepening of the channel. This erosion creates a new and much larger source of sediment, which is transported downstream. No wonder sediment is the largest type of pollution coming from urbanized areas. In most locations across North Carolina, a stream’s natural defense against bank erosion is vegetation. While above-ground stems and foliage do offer protection by slowing the flow of the surface water, it is the roots that provide the most stability. Plant roots can do a good job of holding soil, but their effectiveness relates to their depth. For example, we may think turf grass will prevent erosion, but its roots might only be 4 to 6 inches deep. More stability comes from more deeply rooted trees and shrubs (Figure 1). 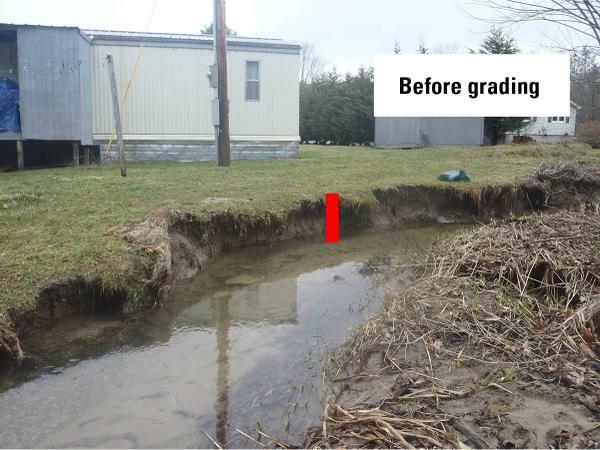 When stream banks lack this reinforcement, unanchored soil can continue to erode until the channel reaches a bed material that can withstand the erosive flows—usually bedrock. It could take a few storms or a few years to see significant impact, but the damage is inevitable. Provide habitat for many types of wildlife (butterflies, hummingbirds, frogs, dragonflies). There are several steps you need to take to evaluate whether your stream is unstable and whether it is a good candidate for some level of repair. Figure 1. Many herbaceous plants have fibrous root systems that can protect banks from surface erosion. Woody species with deeper roots are better at increasing soil cohesion and reducing mass slope failure. A combination of plant types is best. Take a stroll and observe the current conditions, from both the top and within the stream, if possible. Be careful, as steep, unstable banks can collapse unexpectedly! lacking significant root structure along the channel (that is, are roots missing on exposed banks)? comprised of invasive plants such as privet, kudzu, or Japanese stiltgrass? Is the slope of the stream bank almost vertical? Does the stream rise and fall quickly or often flow full with rainfalls? Does the soil along the bank slide off after rains? Is the stream channel getting deeper and/or wider following intense rainfalls? If you can answer “Yes” to any part of two or more of these questions, your stream is a likely candidate for stabilization and/or repair (Figure 2). Figure 2. This highly erosive, unstable stream bank is a great candidate for repair. You have several options once you decide to stabilize or repair your stream. The three options presented in this document have different pros and cons, mostly related to the levels of complexity, expertise required, and of course, cost. Do you want to do the work yourself or hire a professional? Does your stream flow year-round (perennial), seasonally (intermittent), or only during rains (ephemeral)? Note: Ephemeral streams are not typically regulated by municipalities, but perennial and intermittent streams could have restrictions about what you are allowed to do and the types of plants you can use. If the banks are over 5 feet tall, the typical homeowner should seek professional help to assist with solutions. Achieving proper slopes on the stream banks would require significant earth moving, and the height of the banks could cause safety issues for the nonprofessional. Do any culverts or drainage pipes flow into your stream? If so, extra care will be required not only to protect them from damage, but also to reinforce the stream banks near these structures. Is the stream straight, or does it meander through the landscape? Streams naturally meander. If a stream is straight, it is more likely to continue to erode and reshape naturally (although this may not be agreeable to the landowner). Professionals could assist in determining whether reshaping would be beneficial. Does your shoreline have a variety of plant types? If so, you may be able to add a few key plants to further stabilize the banks. There are many ways to manage stream banks. The three options provided below are intended to help you choose a plan of action for your stream. Optimal time of year: This can be done any time of year.This option requires the least amount of effort and is the least expensive. 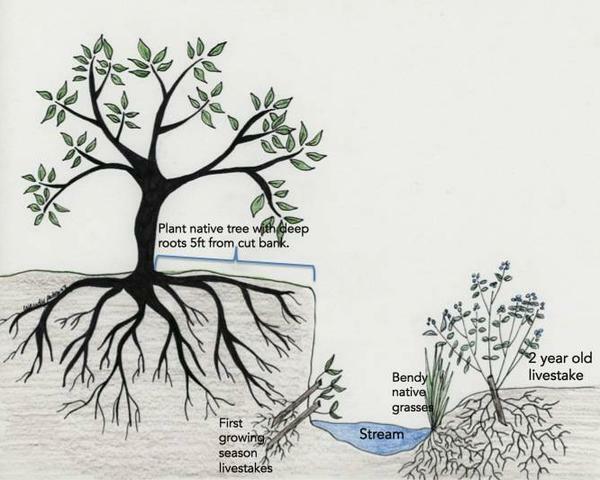 It simply involves allowing the existing vegetation along the banks to grow wild by eliminating mowing (Figure 3). For best results, the vegetation (which could include a mixture of grasses, shrubs, and trees) should be allowed to grow on each side of the creek, typically up to 15 feet from the water’s edge. This method allows seeds in the soil, as well as seeds washing downstream, to germinate and establish on the stream bank. 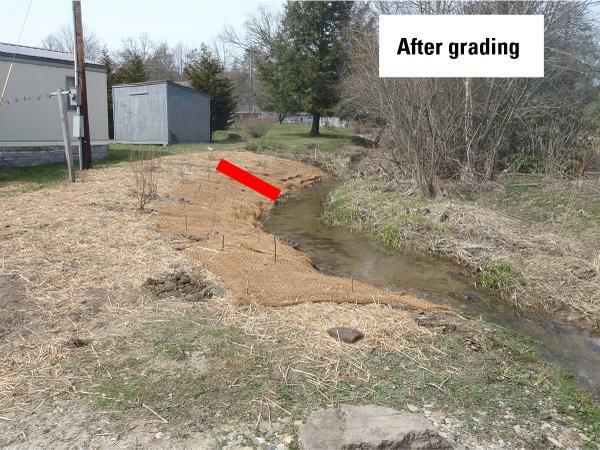 Not only will this option allow the roots along the bank to become deeper and thicker and to provide a more armored stream bank, but the above-ground vegetation will also slow runoff entering the channel from the sides of the stream, further reducing bank erosion. Pros: There is no initial work or cost. Less mowing near the stream reduces maintenance time, as well as safety concerns associated with mowing near unstable banks. Cons: This approach can look weedy, and stream banks can still erode for several years until plants mature. Undesirable plants such as kudzu can take over the area. Depending on the location, some intermittent maintenance may be required to control undesirable plants or to limit the height of some shrubs and trees. Plants may not be able to reestablish in areas of extreme bank erosion (see Option 2). Optimal time of year: Dormant season, typically October to March.If your stream has more severe erosion and areas where plants are unlikely to grow, you should consider additional planting to reinforce your stream banks. Because of their deep roots, native trees are a great choice. Start planting native trees 5 feet from the edge of the bank, regardless of the slope (Figure 4). Live stakes, which are cuttings of certain types of native trees and shrubs that will eventually sprout and grow, can be planted along the water’s edge near the “toe” of the stream bank. The toe is the place where the bank meets the stream bed (Figure 5). Only plant in rows as high on the bank as the soil is saturated. Soil may still slough off. But as plants grow, the root mass will begin to hold the soil together. Keep in mind, the success of these woody plantings will be enhanced if you also spread temporary or permanent seed mixes (sold as “riparian seed mixes”) that include a mixture of grasses and streamside-adapted plants. IMPORTANT—first check to see whether work in the stream requires a permit! See below for more information on this. Pros: This approach is cost-effective and slows erosion. New trees can offer more stream shading. Cons: More effort is involved, and plants can take a while to establish. In areas where there are steep stream banks, this step may be only a temporary fix, and land can still be lost. Typical Cost: ~$5 per linear foot, depending on the size of plants purchased. In this approach, vertical banks are pulled back and graded away from the stream toward the former floodplain, essentially making them flatter, often on a minimum 3:1 slope (Figure 7). Because of the earthwork, these projects require the use of a small skid-steer loader or excavator. Since excavation exposes more soil, the stream banks will need to be stabilized with erosion control matting, in addition to being seeded and planted.This option provides the most ideal technique for creating a stable stream bank, but it requires the most effort and cost. (Figure 6A and Figure 6B). This option will require more planning and will often require the help of skilled professionals. Optimal time of year: Dormant season, typically October to March. Pros: This approach is safer and produces more stable and attractive stream banks. Erosion and loss of land are minimized. Cons: There is greater financial investment, and a permit is often required. Also, heavy equipment may cause soil compaction. Figure 3. This landowner allowed vegetation to grow 15 feet from the water's edge before mowing. Figure 4. Plant diverse, native flora without changing the grade. Figure 5. 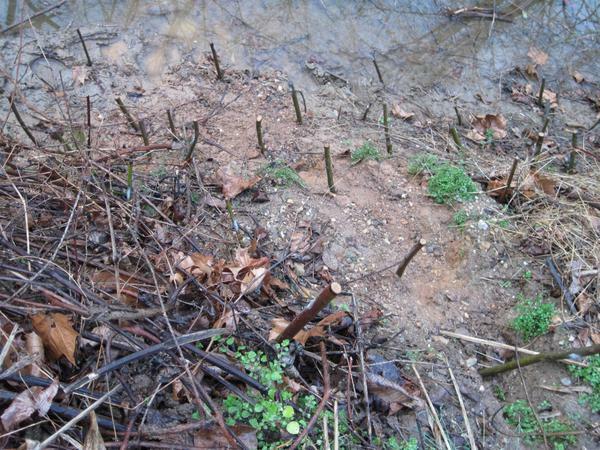 Live stakes installed every foot on an existing slope to create a snag to accumulate leaf litter and other debris, and to promote a quick root mass. Figure 6A. In this stream site in Newland, NC, the landowner’s home is less than 20 feet from the stream, which has 2 to 3 foot vertical banks. Figure 6B. This photo shows a newly graded, stabilized, and planted bank. Figure 7. What does a 3:1 slope mean? For a bank that is 2 feet high, multiply by 3 (2 x 3 = 6 feet). Measure 6 feet back into the landscape and flag it. Grading occurs between the landscape flags (depicted as red circles above). Streams are legally protected. These rules exist to help ensure activities within a stream do not cause harm—even when the intentions are to help stabilize the stream. If you are considering Options 2 or 3 for managing your stream banks, it is important to know whether a permit would be necessary to do work there. This question must be answered before any work can be done. To find out, check with the N.C. Division of Water Resources and the U.S. Army Corps of Engineers to make sure the work would be legal. Streams in the Neuse and Tar River basins have 50-foot stream buffers that are protected by law, so it is better to seek permission to work on a stream than it is to do some work and find that you have violated the law, which may carry a large fine. 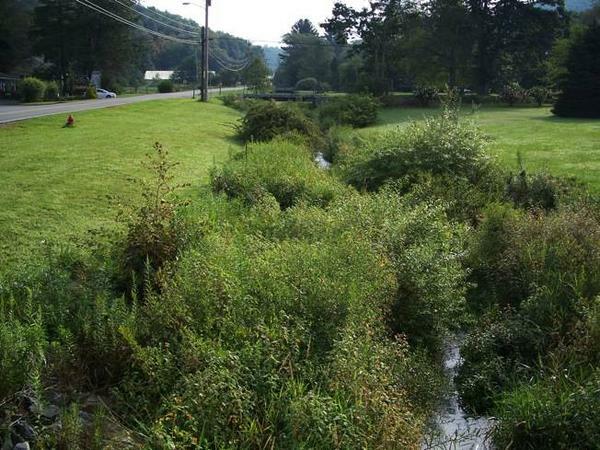 Stabilizing stream banks can be costly, but there are resources that may help. In Forsyth, Wake, and Henderson counties, the local Soil and Water Conservation Districts helped pay up to 75 percent of the cost for materials and grading through their Community Conservation Assistance Program. A local engineering consultant donated time for the design and oversight (required by the Soil and Water Conservation District). Volunteers helped plant the live stakes, plugs, and small containers. Crowd funding sites, like Kickstarter and GoFundMe, could be useful tools for raising funds. However, remember to investigate what kind of taxes would need to be paid if an individual receives the funds instead of a 501(c)3. In that case, it might be helpful for an individual to work with an environmental nonprofit, such as a Riverkeeper. Working with local nurseries and plant sharing with friends are great ways to get vegetation for a reduced cost, too. Protecting or enhancing the vegetated area along the edge of streams makes good sense. Besides stabilizing the stream banks and reducing the erosion of valuable property, this action brings all kinds of benefits to you, your downstream neighbors, and the surrounding environment. The authors would like to thank Wendy Patoprsty, Nancy Stairs, and Dr. Greg Jennings for their early contributions to this publication, as well as Dr. Eban Bean (University of Florida), Dr. Gary Hawkins (University of Georgia), and Dr. W. Cully Hession (Virginia Tech) for their valuable reviews. Funding for the development of this publication was provided in part through an Urban and Community Forestry Grant from the North Carolina Forest Service and the Department of Agriculture and Consumer Services, in cooperation with the USDA Forest Service, Southern Region.